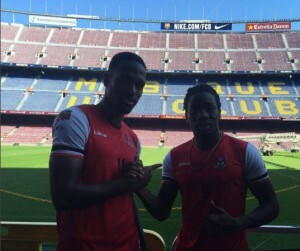 St.Kitts-Nevis International DEVAUGHN ELLIOTT continues to impress and continues to move up the football ladder. Devaughn Elliott (born 28 October 1991 in Saint Kitts and Nevis) is a Kittian international footballer playing as second striker for Ascenso MX club Murciélagos FC. He recorded his first goal in international play during the qualifying campaign for 2014 FIFA World Cup. He is represented by Simone Ghirlanda of Pan American Calcio. Devaughn Papi Elloitt has once again made a move in pursuit of his goal of playing football at the highest level. Papi’s journey started with his beloved Village Superstars FC here in the St Kitts-Nevis Premier League where very early he attracted the attention of the local national coaches. Papi featured for the national U15, U17, U20, U23 and most recently was a part of the Mens Senior Teams that represented the Federation in Europe. His contribution to Superstars and the National Teams of St KItts/Nevis landed Papi a three (3) contract with W Connection FC in the Trinidad and Tobago Pro League. Again after representing the Federation last year in World Cup 2018 Qualifiers Papi play impressed the National Coach of El Salvador who in turn spread the word in his country. Pasaquino FC in the El Salvador Premier league came calling next. Papi shone even more scoring and assisting on numerous game deciding goals. He had become a fan favourite in El Salvador and would celebrate each goal with his traditional salute. His stint with Pasaquino FC only lasted eight (8) months as Papi has once again made a move up the ladder signing a two (2) year contract with Mercielagos FC of the Mexican 2nd Division. Mercielagos FC is located in Guamuchil, Sinaloa, Mexico. On Saturday January 22nd Papi sporting the number 49 kit/jersey enjoyed his first start with his new team and provided an assist in a 3 0 victory for Mercielagos FC.